I love what Hopkins is saying in the poem, but what I find so fascinating is not so much what he says as how he says it. He quite obviously loved to toy with both the meaning and sound of words. I’m going to talk about some of the things he does in this poem, but I’m a little hesitant to do so. Teachers of literature have a bad reputation for over-analyzing poetry, and I understand there is risk to this kind of scrutinizing. It can take the joy out of it — like having to explain a joke. I mean, if you don’t get it, you don’t get it. This is a sonnet. As I learned from Richard Foster in his book How to Read Literature Like a Professor, you can usually spot a sonnet by its square shape. A sonnet is a rather rigid form and, as a result, a difficult form. Fourteen lines of iambic pentameter (accent on every other syllable, five stressed syllables per line). In this case, a Petrarchan or Italian sonnet, composed of two parts: an octave (8 lines) followed by a sestet (6 lines). The rhyme scheme for the octave is the traditional a-b-b-a-a-b-b-a. The sestet rhymes in the pattern c-d-c-d-c-d. If you doubt that writing a sonnet is difficult, try it yourself. Even excellent writers find it challenging to communicate something meaningful, much less something profound and beautiful, within these strict parameters. Hopkins holds only loosely to iambic pentameter here. He throws off the rhythm in various places and adds an extra syllable to a line here and there. It’s not possible to read this in a sing-song style. It’s more conversational than musical. Another thing that throws off the rhythm (and makes it hard to spot the rhyme) is the technique of enjambment, which is where the poet continues a clause or sentence from one line to the next. We are more used to end-stopping, where a thought is completed by the end of each line. Hopkins often ends his thoughts mid-line. This is why it would be difficult to discern where lines begin and end if we only hear the poem read aloud. Notice how the repetition of “Generations have trod, have trod, have trod” forces the reader to slow down. That line ingeniously reads with a cadence that imitates the tread of feet. Awesome, right? The end rhyme (rhyming of the last words in the lines) is strictly according to sonnet form (God, oil, foil, rod, trod, toil, soil, shod, spent, things, went, springs, bent, wings), but because of the enjambment, we almost don’t notice them. We do, however, notice the various internal rhymes Hopkins sprinkles throughout: men/then, seared/bleared/smeared, wears/bears. …over the bent/world broods with warm breast and ah! bright wings. Nine one-syllable words that roll off the tongue. Say it out loud. Seriously; you know you want to. Say it again. And again. See what I mean? I love the repeating n’s in “men then now not.” I love the rhyme of men/then, the implied paradox of then now and the final alliteration of reck/rod. I’ll never write a line that good in my entire life! By the way, reck means “to give heed to” and God’s rod is a symbol for his authority or rule. Hopkins is wondering why, given the glory of God so powerfully displayed in nature, men do not more readily bend their knee to Him. Hopkins, by the way, was a priest as well as a poet. Oh, there’s plenty more: interjections like Oh! and ah!, the imagery of shook foil, oozing oil, and brooding with bright wings. But I’ll stop there — leave you with something to think about yourself. So, how was that? Too much jargon? Too fine a dissection? Or did it help you see this wonderful poem from new perspectives? After reading this, do you like the poem more or less? I found this helpful for doing research on this website. great writing style. Thankyou. Brian, I stumbled across this poem in other writings and was entranced by the final imagery, but hit a roadblock in overall understanding of the poem. Your “reck his rod” explanation helped quite a bit! Additionally, I love the way you invite us to simply savor the beauty of the language. I bounced around to a few analyses but stuck with yours because your writing was admiring and fluid. Thanks! This has been one of my favorite poems since college (many years ago). I’m reading, “How the Irish Saved Civilization” by Thomas Cahill, and he makes reference to this poem in his book. I decided to look it up online & print it out for my office. Happily, I came across your blog. I’m adding you to my ‘favorites’ list. Thanks! Thanks for your clarification of this poem. I have it for a class assignment. 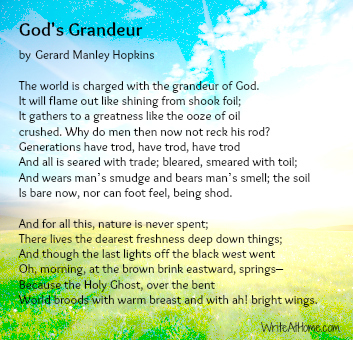 I had a fair idea of what the poem is all about after reading Hopkins’ bio, but didn’t have good interpretation of some of the sentences there. Your explanation helped a great deal. Thanks! Glad you found it helpful, Winnie. I remember helping students who were taking an online literature class when they were to write a sonnet. They are difficult! I was encouraging them to hold strictly to the rules (no poetic license yet for them), and they did. I corrected and encouraged before they submitted, and they did receive excellent marks from their online teacher. One thing that seemed particularly difficult in iambic pentameter was to accent the second syllable in each line instead of the first. I see there is some poetic license taken in this poem on that . It is a beautiful poem, and, thank you for explaining “reck his rod,” so I didn’t have to go researching. Even the best took some liberties with the meter, Lena. I think it’s a good idea to make students try for perfect iambs, though. At least it gives them an appreciation for the challenge of writing formal poetry. I have long appreciated enjambment but didn’t know what it was called. What a wonderful word. Thank you for your regular and diverse articles. Great, Mary! I just hope it helps them appreciate it more. Thanks for this… it’s a wonderful poem, and your commentary added to my appreciation of it greatly. I especially appreciated that you talked about the line, “Why do men…” — I was struggling with that one a bit! That’s great, Ruth! Thanks for the encouraging comment.